I've been absent a bit from blogging. Mostly because I'm focusing more and more on being present in my life and sometimes blogging feels like an interruption of that. Couple that with last week's election in the US and all the dismay swirling; a girl could use some levity. Tonight, I found it. Here's the skinny. I recently ordered these pants from Patagonia and these pants - both of which I love. I also ordered these pants that I didn't love as much. 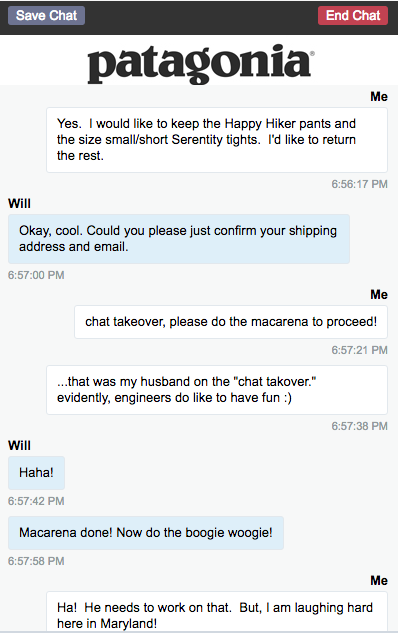 I started an online chat with a rep from Patagonia to figure out how to return the pants I didn't want. You can see our chat screenshots below, but I'll type in the conversation next. Me: Yes, I would like to keep the Happy Hiker pants and the small/short Serenity tights. I'd like to return the rest. Will (rep from Patagonia): Okay, cool. Could you please just confirm your shipping address and email. Mr. UpCyclist does a chat takeover: Please do the macarena to proceed! Will: Haha! Macarena done! Now do the boogie woogie. Me watching Mr. UpCyclist dance: Ha! He (Mr. UpCyclist) needs to work on that, but I am laughing hard here in Maryland. Me: Fantastic, Will. Shall we close this very short exchange with a dance move? I am inspired. Will: Haha, the wave was just sent your way! Me: Back at you. Very creative choice, Will! Have a lovely evening! Will: You as well Jen! Thanks for the fun and laughter!!! That, my friends, is just what was needed. Ease in returning products from one of my favorite companies on the planet, Patagonia. A husband who went against the norm and turned up the silliness. And a stranger - Will - who took the playfulness and ran with it. 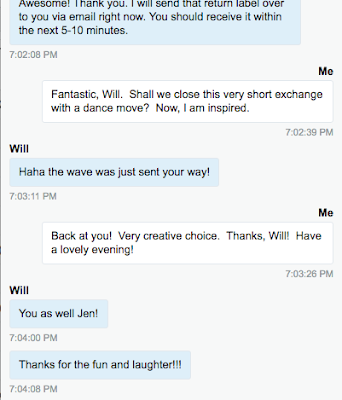 Thanks, Will, I'm still smiling that you didn't miss a beat and embraced the macarena-infused chat while GSDing (getting stuff done). I am grateful. Thanks, Mr. UpCyclist - you never cease to amaze me. Just when I have you figured out, you surprise me. Thanks, Patagonia for hiring a culture of awesome, openminded rockstars like Will. And thanks, Universe. Levity is exactly what I needed.